We live in a social media age, and more and more businesses are beginning to realize how powerful social media platforms can be when used as a marketing tool. Most people are familiar with Twitter, Facebook, and even LinkedIn. However, what about Google+? Google+ is perhaps the most underutilized social media platform for businesses of all sizes, especially online businesses, which is odd considering how effective of a tool it can be. It could be that, given the popularity of Twitter and Facebook, businesses simply don’t know how to use Google+. So, let’s find out what it is and how businesses can use it to their benefit. Google+ is a relatively new social media platform that has been around since 2011. Anyone who has a Gmail account can use Google+. In fact, if you use Gmail, then you already have a Google+ account, so there are no additional steps to get a Google+ account. Like any social media account, Google+ is often used for business and personal use, depending on the needs or preference of an individual or businesses. However, for those wishing to use the platform for business purposes, you’ll first need to create a personal Google+ account and then a separate page for your business. With Google+, everything is linked. In terms of its similarities to other popular social media platforms, Google+ functions much like Facebook and Twitter. For example, Google+ allows users to share posts via your profile in an effort to build followers and foster social interaction over content posted you your page. For businesses, a Google+ profile page alone is a great marketing tool, because you can post relevant content about your business and connect with potential customers or clients you otherwise wouldn’t have. Also, by posting content with links to your website, Google+ can be used to drive more traffic to your website. 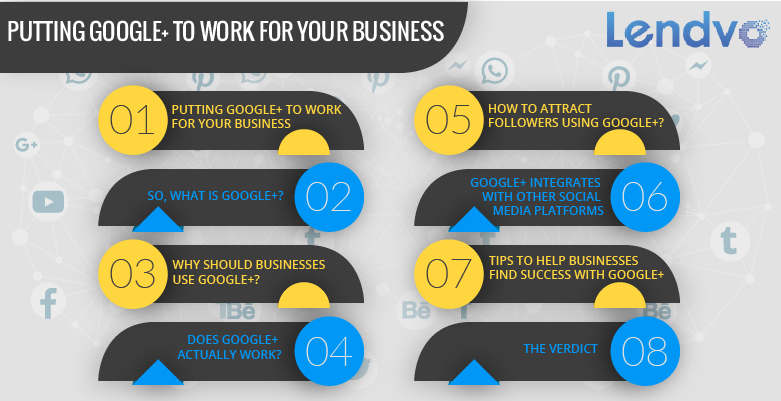 Why Should Businesses Use Google+? AdWords: Google+ can help boost AdWords campaigns. Google AdWords is a paid advertising system that allows advertisers to bid on keywords for their ads in order to improve their ranking in search results. It’s a valuable tool, and when paired with a Google+ business page, any clickable ads you have will be seen by your followers, driving even more traffic to your business. SEO: Google+ is great for Google SEO and can help your business website rank higher. It’s especially useful for online businesses. Local brick-and-mortar businesses should also use Google+. By giving Google details like your business location, services offered, and contact details, Google will ensure that a small box with your business details is displayed whenever a potential customer types your business name into a Google search. Ads: Businesses who have 1,000 followers or more can take advantage of Google+ advertising options, such as +Post Ads. Branding: Since Google+ is a social media platform, having a business page will really go a long way in improving your online reputation and brand. Essentially, it’s another avenue for businesses to interact with potential and existing customers online, which can help garner customer interest in a particular service or product your business offers. Seeing a pattern yet? It’s all about driving more traffic to your business and nurturing customer relationships via interaction. SERPs: At the end of the day, the main reason why businesses should use Google+ is that it is great at helping to increase visibility in Google search results. Often times, content you post on your Google+ business page, whether it’s a blog post about your industry or an ad about an upcoming special or event, is more likely to get viewed by potential customers than simply relying on people to visit your actual business website. In being smart about keywords, writing good content, and utilizing SEO tools, Google+ can be the difference in growing your online presence and attracting leads or not. This is a fair question, considering how few businesses actually fully utilize Google+. While it’s true that it’s not as popular as Twitter or Facebook, that doesn’t mean it doesn’t work. Regardless of how many businesses use it, it remains a great tool for generating leads and improving a business’s ranking in the Google search results. Besides, who says you can only have one social media channel for your business? Some businesses might find great success in having Facebook, Twitter, and Google+ business pages. Others might find the use of Facebook or Google+ effective enough on its own. It really boils down to what works for a particular business. How to Attract Followers Using Google+? So, we’ve established that Google+ for businesses does indeed work and that it can be a particularly effective marketing tool. But how can businesses attract followers? After all, the best way to take full advantage of all the perks of a Google+ business account is to have a lot of followers. For example, in order to gain access to your link for your Google+ business page, you have to have a minimum of 100 followers. To use +Post ads, you need at least 1,000 followers. For small businesses, these numbers can seem a bit daunting. So, what are some tried and true methods of attracting followers? Much like attracting fans to a business page on Facebook, what you post on your page matters. Posting information that people are interested in reading and learning about is a surefire way to compel people to follow you. It’s also important to note that the more popular your particular niche is, the more likely it is that people will be drawn to your page and become long-term followers. Another reason why businesses should invest some time into crafting an effective Google+ page is that it integrates with other social media platforms, such as Gmail and YouTube. Integrating with other platforms is a great way to boost your exposure and online presence even more. YouTube: Because this popular platform processing more than three billion unique searches each month, it has quickly grown into the second biggest search engine. Because Google owns YouTube, Google+ seamlessly integrates with the media platform so that all of your networks are on the same Google account. Additionally, YouTube is a particularly great tool for businesses with video content because you can link videos back to your Google+ page. Since many people are visual learners, videos are a good tool for attracting followers. Gmail: Google really tries to make it easy for businesses to keep all of their networks on one account, and that goes for Gmail. Recently, Google+ evolved so that business and personal pages are integrated with Gmail. There are a few little tips and tricks to the trade to help you and your business find success when using Google+. For starters, outfit your business page with eye-catching cover photos and a fun design relevant to your business. Also, Google+ recognizes and allows the use of hashtags in posts, much like Twitter. Taking advantage of hashtags when posting content to your business page is an effective way to attract followers. Another useful tip is to encourage customers to leave reviews on your Google+ page. Google considers customer reviews when determining a website’s ranking in the search engine results pages (SERPs). Additionally, don’t be afraid to interact with your followers and other businesses via Google+. Seize the moment to grow your circles by adding influential people. The more you interact on Google+ and connect with others, the more likely it is that people will interact with your posts, all of which can improve your ranking in search results. Lastly, always connect your Google+ page to your businesses website. Let people know that you exist and are active on social media. While it’s not the most popular social network platform, there’s no denying its usefulness as a marketing tool for small and large businesses alike. Give it a try and see if it works for you.